Millions of grant dollars for her home state. Restore Public Trust found that since becoming Transportation Secretary, Elaine Chao has used her position to award millions of grant dollars to contractors and projects in Kentucky, the state where her husband, Senate Majority Leader Mitch McConnell, will face a tough re-election in 2020. RPT found that in 2018, the Department of Transportation spent nearly $14 million on projects located in Kentucky, an over $11 million increase from the final year of the Obama Administration. New government offices for her home state. In 2018, Elaine Chao’s Department of Transportation chose Paducah, Kentucky, as the site of a new DOT maritime gateway office. Paducah, with a population of about 25,000, is the smallest town to host a DOT maritime gateway office. Other offices are in major hubs such as New York and Miami. Membership on the board of a scandal-plagued bank. Between 2011 and 2017, Elaine Chao served on the Wells Fargo Board of Directors, a position for which she was compensated over $2.2 million. During Chao’s tenure overseeing Wells Fargo, the bank was plagued with scandals, including creating up to 3.5 million fake deposit accounts, often targeting vulnerable consumers. A gig with one of Rupert Murdoch’s media conglomerates. Elaine Chao was a Board Member at Rupert Murdoch corporation News Corp before she became Transportation Secretary. Promotion of her family’s shipping company. Last year, Secretary Chao came under fire for using her position as Transportation Secretary to promote her family’s shipping company overseas when she participated in a series of interviews with him in front of the official DOT flag. 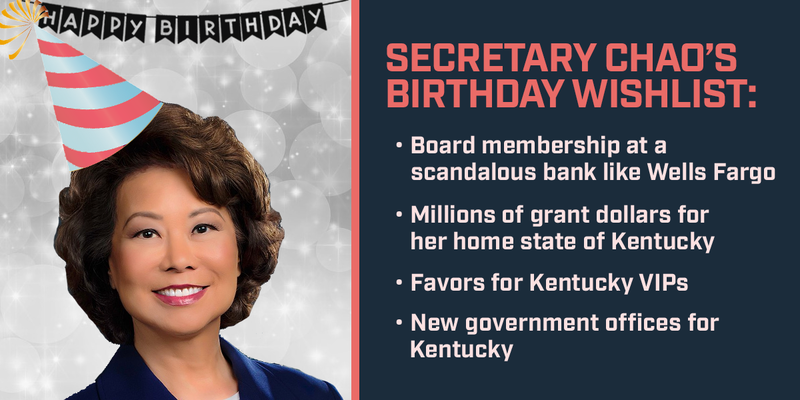 Happy Birthday, Secretary Chao! We hope your next year as a public servant is scandal-free, but based on your past, we doubt it will be.